Preface. List of Symbols. 1. Water Hammer. The origin of water hammer. Physical principles. Actual cases. Causes of water hammer. Examples of water hammer. 2. Basic Equations. Derivation. Scope of application. 3. Solution of the Basic Equations. Methods of solution. Application of the method of characteristics. Schematization of the pipe-line system. 4. Parameters of the Basic Equations. Velocity of propagation of the pressure wave. Pipe-line diameter. Density of the liquid. Pressure losses due to friction. Velocity of the liquid. Solid particles in the pipe-line. Gas in the pipe-line. Pressure in the pipe-line. Cavitation. 5. Damping Devices. Junction without a damping device. Constant pressure. Reservoir. Air chamber. Surge tank. Overflow. Air inlet valve. Cavitation. Integrated damping device. Pressure. Discharge. 6. Pressure Devices. Attachment without a pressure device. Closed pipe-line. Local loss. Control valve. Non-return valve flap. Butterfly valve. Condenser. Pump. Turbine with fixed characteristics. Turbine with variable characteristics. Turbine controlled by a governor. 7. Calculation of Water Hammer. Computer application. Preparation. Input data. Data input and output of the results. Solution for the sections. Solution for the junctions. The initial state. Calculations for the damping devices. Calculation for the pressure devices. Calculation procedure. Iterative solution for the junctions. Checking whether a steady state was attained. Maximum and minimum values. Submission for several calculations. 8. Calculation of the Steady State. Abridged calculation of the steady state. Modification of the pipe-line sections. Modification of the damping devices. Modification of the pressure devices. Submitting the calculation. 9. Input Data File. Name of the calculation. Sections. Junctions. Parameters. Type of calculation. Graphical and numerical outputs. Subtitle of the calculation. 10. WTHD Program for Creating the Input Data File. Starting work with the WTHD program. Adding a data line to the end of the file. Inserting a data line into the file. Deleting a data line from the file. Modifying a data line. Adding a further data line. Formal checking of the file. Listing of a data file. Plotting of functions. Terminating the WTHD program. 11. Output of the Results. Main output. Graphical output. Numerical output. WTHG program for plotting the numerical output. 12. Reduction of Water Hammer. Adjustment régime of a valve. Pump. Surge tank. Air chamber. Other methods of protection. 13. WTHM Program for the Calculation of Water Hammer. Basic layout of the program. The main program. Subprograms. Errors in the calculation. Denotation of the variables. 14. Examples of the Calculation of Water Hammer. Abrupt closing of a pipe-line without considering the effect of pressure losses due to friction. Abrupt closing of a pipe-line with the effect of pressure losses taken into account. Control valves in the delivery pipe-line of a pump. Calculation of the characteristics of a valve from pressure measurements. Calculation of the valve control régime producing a required pressure or discharge curve. Calculation of the steady state of flow in a pipe-line network. Periodic variations in pressure. Protection of a delivery pipe of a pump by an air chamber. Water hammer induced by cavitation after disconnection of a pump. Calculation of discharge from pressure measurements. Calculation of the characteristics of a pump from the measured pressures and speed. Starting-up of a pump with an electric motor, a butterfly valve and a condenser. Turbine with variable characteristics. Governor-controlled turbine. Appendix A: Subprograms for the damping and pressure devices. Appendix B: List of files on WTHM diskette. Bibliography. Index. 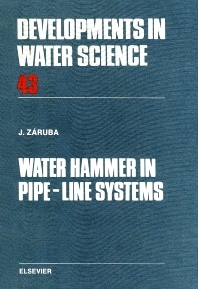 The physical principles of water hammer are explained in this volume. The basic mathematical methods of solution of water hammer and ways of limiting its effects are covered. Detailed description is given of the method of characteristics and the corresponding programs for personal computers, which enables solution of water hammer in a wide variety of hydraulic systems encountered in practice. Examples are given of solution of water hammer of common pipe-line systems as well as calculation of the steady state of flow, the determination of discharge through a pipe-line, measurements of characteristics of valves, pumps, turbines, determination of the operating régime of a valve in order to ensure a desired pressure and discharge curve, etc. This book will be of interest to those civil, mechanical and petroleum engineers dealing with the design and operation of hydraulic systems.